A friend told me that gorgeous Icelandic scenery is featured in The Secret Life of Walter Mitty, so I went to see the film as soon as I could. She was right! The very first Icelandic scene was on the highway southwest of Stykkishólmur, on the Snæfellsnes peninsula. 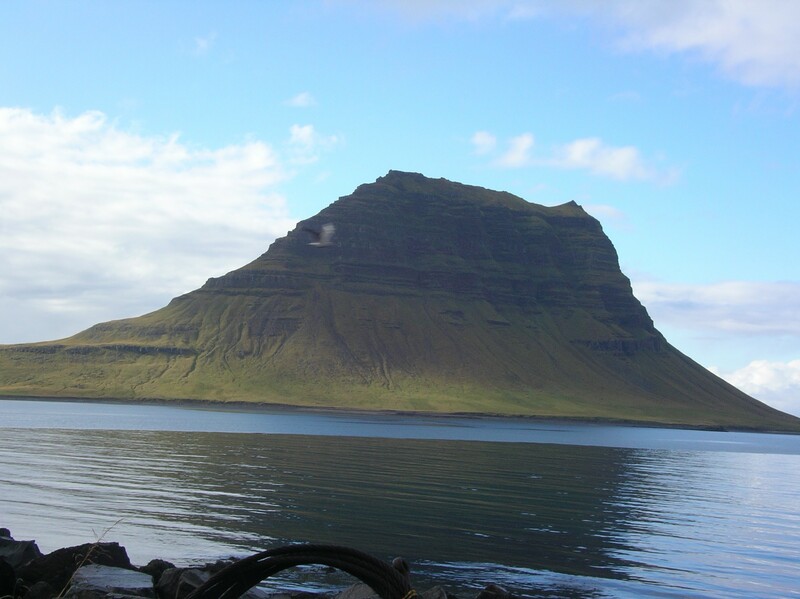 I took a snapshot of Kirkjufell, the symmetrical hill that appears early in the Icelandic sequence, the last time I was in that area. After that, the Walter Mitty character (Ben Stiller) executes a trade with a trio of Icelandic lads for a skateboard, and zooms off down the highway. Although seeming to understand English, the kids discussed the deal in Icelandic. I didn´t quite catch what they said, but I doubted that the English subtitles really captured their dialogue. Then their father called from the car. He very clearly said‚‘‘Núna! Núna! Núna!‘‘ which meant ‚‘‘Right Now!‘‘ and they went running. The Icelandic scenery that the movie´s lead character (anti-hero?) flew past on the newly acquired skateboard could serve as tourist board marketing footage for a section of Iceland. Then he skates past a very large pipeline – which in Iceland carries very hot water from a geothermal plant or well – to a city hot water system. I don´t remember seeing such a pipeline near Stykkishólmur (the small town that is mentioned in the film script), but I have seen them outside of Reykjavik. So where does Eyjafjallajökull come in? Mitty is pursuing a globetrotting photographer in search of a particular photo for the last print cover of Life Magazine. The trail led from New York to Greenland to Iceland. After gaining the skateboard he meets a man who cannot help him – but soon returns – too excited to speak English: ‘‘Eldgos!‘‘ he shouts. Few in the theater realize he is warning of a volcanic eruption, and the subtitle gives little information. But suddenly a very large, very dark cloud appears above the village buildings, Mitty hops into the moving car and they race off, trying to outrun the volcanic cloud. Eyjafjallajökull – nicknamed E15 for non-Icelandic speakers – is located on the other side of the country from the west coast town Mitty nominally arrived in from Greenland. The volcano´s 2010 eruption may still be in viewers´visual memories of the TV news that featured it. Big dark ash clouds were certainly part of its reality! I have since learned that all of the international footage in the movie was filmed in Iceland. The island nation has the landscape to represent a village in Greenland, itself, and the mountains of Afghanistan – and showed off its splendor in this film. I don´t think that we actually saw any of Eyjafjallajökull´s glacier or volcanic landscape, but the cloud did a good job of representing the most memorable aspect of its spring 2010 eruption. Hi, I’m glad I found your blog. Similar interests. Also, on this topic I just saw Noah that was filmed all in Iceland. It showed the bleak landscapes that must have been filmed inland but also all the beautiful rich, green valleys. Stunning in the end. Yes, Noah is on my list to see. It is almost worth watching the “how we made this movie” clips to figure out where they did their filming. I have read a few of your posts, but plan to read more.